Summer is at its peak here. The earth looks dry and dreary. It is hard to believe that the same landscape was once a splendor in the Spring where the juicy vegetation and flowers in all the colours and hues adorned the Earth. Some vagrant clouds sail across the sky raising hopes of a shower that would bring great succor at this point of time. But the roaring winds drive them away clearing the way for the Sun to continue spewing fire. Birds flit listlessly from branch to branch, biding most of the time in the tress with thick canopy. For kids and animals the heat is no deterrent to their pranks and antics. My daughter discovered a frog in the fish pond and was greatly amused by the guest. She tried to feed him but it dived and hid under a stone. Since then she has been observing and watching him share the pond with our carps. Our cat rests under a tree in the afternoons. 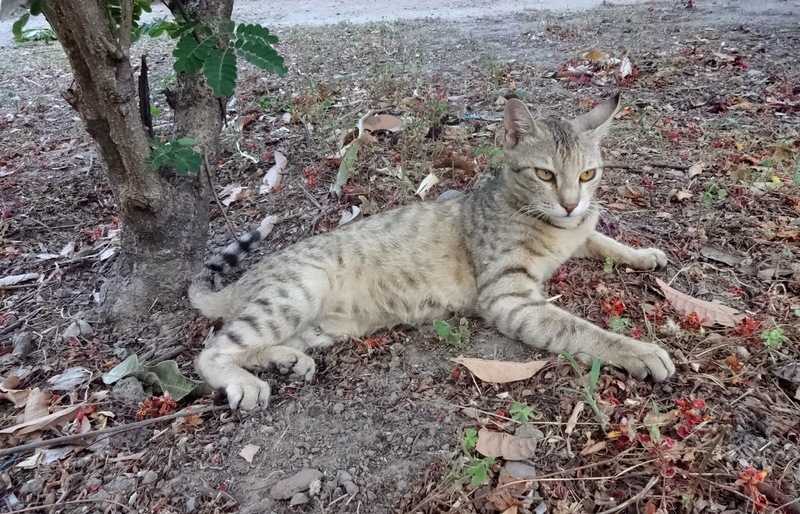 Her fur perfectly merges with the dry foliage and camouflages her. 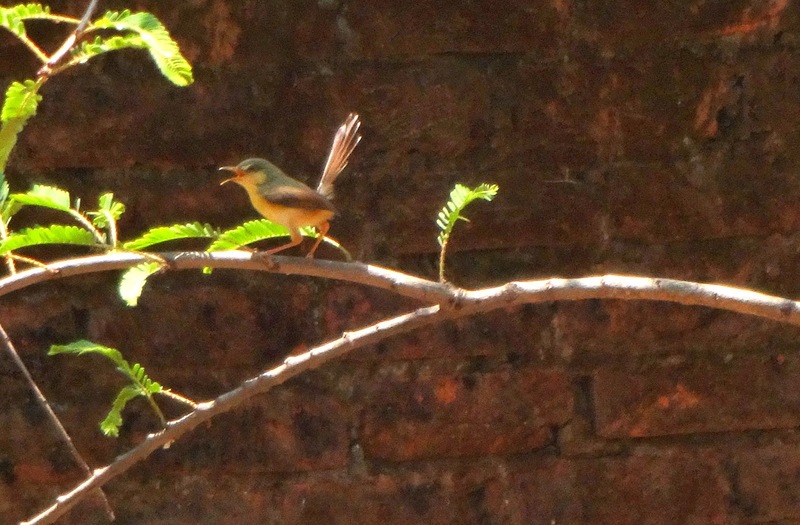 After several unsuccessful attempts in catching birds, she runs after and plays with the dry leaves that roll and rustle as the hot winds push them in all directions. Heat and heat induced lassitude makes it uncomfortable to work in the kitchen. 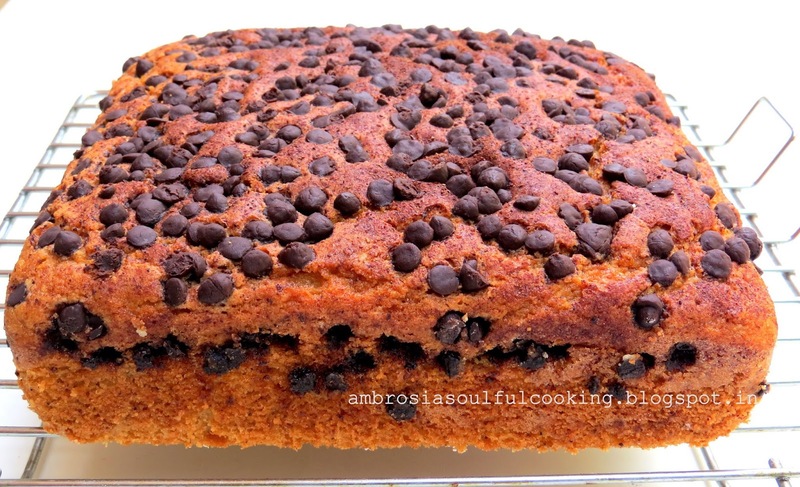 After a long break I baked whole wheat chocolate chip cinnamon cake yesterday. Made some cup cakes with the same batter and my kids loved them. 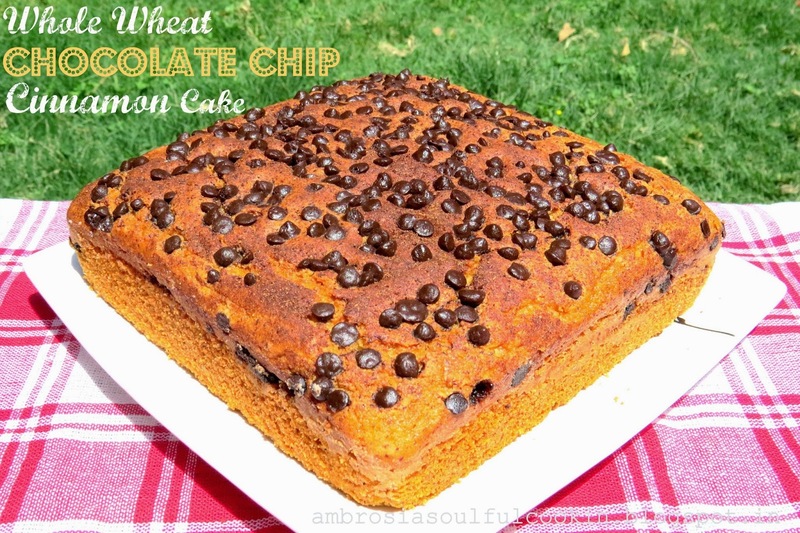 Chocolate and cinnamon make a great combination while whole wheat flour reduces the guilt quotient in this cake. 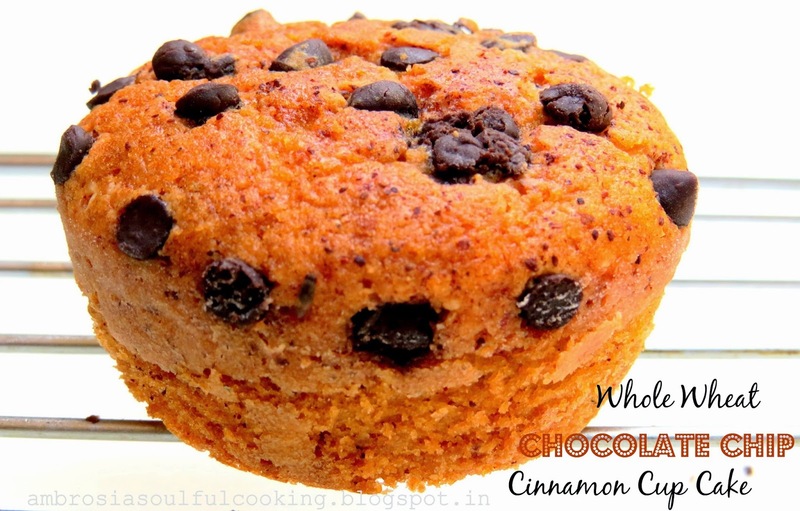 And the heavenly aroma of cinnamon fills up nooks and crannies of your home while the cake bakes! Preheat oven to 180 degrees C. Line and grease one 7x7 inch cake pan. Whisk together flours, baking powder, baking soda, salt and cinnamon. Beat butter and sugar in a large bowl till fluffy. Add eggs one at a time, beating well after each addition. Add vanilla essence. Beat yogurt in a small bowl till smooth. Add milk. Add flour mixture to butter sugar mix in two rounds. Add yogurt mix alternately. Mix well till the batter becomes smooth. Do not over mix. Spoon the batter evenly into the prepared pan. Make the top smooth with an offset spatula. Sprinkle chocolate chips evenly on top. Combine cinnamon powder and sugar. Sprinkle evenly on top. Bake for 20 to 25 minutes or till the cake shrinks from the sides and a toothpick inserted in the center comes out clean. Remove from the pan after 10 minutes. Cool in the rack. I can see that its cinnamon season in your home... one after another lovely cinnamon bakes! Very lovely looking cake Namita, loved the chocolate chips dots on the cake. I have not tried cinnamon flavour with chocolate, will give it a try. Your writings are beatuiful, gives a clear visual image of the scenario. The heat is at its peak here too! Sigh... these summers! Soory! Yo say, "Beat curd in a small bowl till smooth. Add milk". But I can not see "curd" in the Ingredients list. What do you mean as you write "curd"? Hello, I meant yogurt. I have edited the post. Thank you for bringing it to my notice.